For other political movements known by this name, see Podemos. Podemos (Spanish: [poˈðemos], translated in English as "We can")[a] is a political party in Spain founded in January 2014 by political scientist Pablo Iglesias in the aftermath of the 15-M Movement protests against inequality and corruption. Podemos is a left-wing populist party that seeks to address the problems of inequality, unemployment and economic malaise that followed in the wake of the European debt crisis. Podemos has called for a renegotiation of austerity measures and seeks to curtail the Treaty of Lisbon. The term "populist" is sometimes used by political opponents to refer to the party in a pejorative way. Podemos is the second largest political party in Spain by number of members after the People's Party (PP). It became the third largest party within the first 20 days it allowed membership, with 100,000 signing up in that period and its membership grew to more than 487,000. In the 2014 European Parliament elections on 25 May 2014, Podemos received 7.98% of the national vote, with 1,200,000 votes cast, electing five Members of the European Parliament (MEPs). At the elections for the national parliament on 20 December 2015, Podemos received 21% of the vote and became the third largest party in the parliament, with 69 out of 350 seats. On 9 May 2016, Podemos formed the electoral alliance Unidos Podemos with United Left, Equo and minor left-wing parties. In 2018, the party joined Maintenant le Peuple. Podemos came from the aftermath of the Indignados movement against inequality and corruption in 2011. The group was inspired by the populist leaders of Latin America's "Pink tide", which included Venezuela's Hugo Chávez and Bolivia's Evo Morales. Its origin can be found in the manifesto Mover ficha: convertir la indignación en cambio político ("Move A Piece: Turn Indignation Into Political Change"), presented over the weekend of 12 to 13 January 2014, which was signed by thirty intellectuals and personalities, such as Juan Carlos Monedero, associate professor of political science at the Complutense University of Madrid (UCM); the actor Alberto San Juan; Jaime Pastor, associate professor of political science at the National University of Distance Education (UNED); the writer and philosopher Santiago Alba Rico; the former leader of the Left Trade Union Current Cándido González Carnero; and Bibiana Medialdea, associate professor of applied economy at the UCM. Podemos' manifesto argued that it was necessary to create a party list for the European Parliament elections that year, with the goal of opposing the dominant policies of the European Union from the left. Even though he was not one of the signatories of the document, on 14 January it was announced that Pablo Iglesias, a professor of political science at the UCM and a TV presenter, was to head the movement. The movement was organized by the party Anti-Capitalist Left (Izquierda Anticapitalista), the Spanish section of the Trotskyist Fourth International, which had written the Mover ficha manifesto in its internal documentation, designing the stages to launch the new movement. One of the points highlighted by Iglesias was the derogation of the 135th article of the Constitution, which was made in 2011 by the major parties People's Party (PP) and Spanish Socialist Workers' Party (PSOE); full application of the 128th article of the constitution ("All wealth of the country in all its forms and no matter who owns it, is subordinated to the people's interest"); and maintaining abortion rights. They also demanded Spain exit from NATO and support self-determination rights. The Podemos movement was officially launched on 16 January 2014 in the Teatro del Barrio in the Lavapiés neighbourhood of Madrid. A press conference was given, with the attendance of hundreds of people, at which spoke Pablo Iglesias; Juan Carlos Monedero; the USTEA trade unionist, Marea Verde activist and Anti-Capitalist Left member Teresa Rodríguez; the psychiatrist and member of the Marea Blanca, Ana Castaño; the researcher and analyst Íñigo Errejón; and the social activist, militant and head of the Anti-Capitalist Left party list for Madrid in the 2011 general elections, Miguel Urbán. Its fundamental goal was to oppose the austerity policies which were being applied. In order to run in the European elections of 2014, the members of the bare bones of Podemos set themselves three conditions: to receive the support of at least 50,000 people; that both the programme and the lists of candidates be prepared through open participation; and that unity be sought with other parties and movements of the left, such as United Left, the Popular Unity Candidacy, the X Party, the Andalusian Workers Union, Anova and the citizens' mareas ("tides"). The 50,000 signatures were obtained in less than 24 hours and the Podemos website crashed due to the high traffic. In August 2015, Podemos endorsed Jeremy Corbyn's campaign in the Labour Party leadership election. The party's international secretariat released a statement saying: "In Podemos we share Jeremy Corbyn's view that another Europe is not just possible but necessary". It added: "Against the irresponsibility of the troika and the Eurogroup, against the Europe of financial lobbies and puppet representatives, a new democratic and social Europe is emerging, and Jeremy Corbyn's victory would be a great step in that direction". 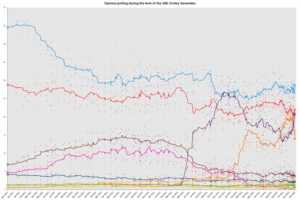 On 25 May 2014 Podemos entered candidates for the 2014 European Parliament election, polling with 7.98% of the national vote and thus was awarded five seats out of 54. The party's MEPs joined the European United Left–Nordic Green Left (GUE/NGL) group. Regarding the election, Pablo Iglesias was described as pessimistic by El País: "We have lost these European elections. They have been won by the People's Party. We cannot be happy about this". He stated that his objective is to "move forward until we throw the PP and the PSOE out of power" and that "[w]e will now work with other parties from the south of Europe to make it clear that we don't want to be a German colony". Iglesias said Podemos MEPs would not take the standard MEP salary of more than €8,000 a month, stating that "not one of our MEPs will earn more than €1,930, an amount that's three times the minimum wage in Spain". 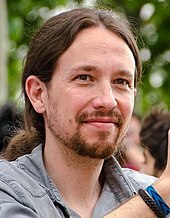 On 5 June 2014, Pablo Iglesias announced that the Asamblea Ciudadana "Sí se puede" (Citizens' Assembly "Yes, it can be done") would take place in the autumn. Iglesias also announced that a team of twenty-five persons would be responsible for preparing the assembly, to be chosen in open elections (in which anybody could participate) with closed lists, with no limit to the number of lists which could be presented. The vote took place over the Internet on 12 and 13 June. Two lists were presented, one of them headed by Iglesias and the other promoted by the Círculo de Enfermería ("Nurses' circle"). The technical details of the election and the deadlines generated discussion within Podemos. In a meeting of Podemos circles which took place on 8 June in Madrid, there was criticism for both the closed lists and the short deadlines, which allegedly led to fewer lists being presented. The electoral process in which 55,000 people participated gave the victory to Iglesias' list, with an 86.8% of the vote. A major part of the citizens' assembly consisted in the writing of documents defining the political and organizational principles of the party as well as resolutions the party would adopt. Any member of Podemos could present a document and these would be adopted or rejected in a vote with all members of Podemos participating. These documents would determine the structure of the party; and after that, internal elections would take place, again with the participation of all members of Podemos, to fill the positions defined by this structure. The citizens' assembly had a meeting in Madrid during 18 and 19 October. On 19 October, Podemos membership was 130,000 and on 22 October it was 170,000. The citizens' assembly resulted in the adoption of resolutions by the party, which were the five most voted, all of which were submitted by circles. Every member could vote for five resolutions. The approved resolutions were on improving public education (45%), on anti-corruption measures (42%), on the right to housing (38%), on improving public healthcare (31%) and on auditing and re-structuring the debt (23%). The ethical, political and structure documents proposed by the "Claro que Podemos", which included Luis Alegre, Carolina Bescansa, Íñigo Errejón, Pablo Iglesias and Juan Carlos Monedero were approved by 80.7% of the vote, surpassing "Sumando Podemos" 12.3% of the vote, promoted by the MEPs Pablo Echenique, Teresa Rodríguez and Lola Sánchez in the vote for the structure document. In October 2014, Podemos decided not to stand directly in the May 2015 local elections in Spain. Instead, it decided that its members would support local grassroots candidacies, most notably Barcelona en Comú, the citizen platform led by anti-evictions activist Ada Colau in Barcelona and Ahora Madrid (led by ex judge Manuela Carmena) in Madrid. At the general election on 20 December 2015, Podemos reached 20.65% of the vote and became the third largest party in the parliament after the People's Party with 28.71% and the Spanish Socialist Workers' Party with 22.02%. In the new parliament, Podemos hold 69 out of 350 seats and this result was described as ending the traditional two party system in Spain. Following the failure of the 2015–2016 Spanish government formation negotiations to create a stable coalition government, on 2 May 2016 a second general election was called for June 2016. To contest the election, Podemos formed an electoral alliance with United Left, Equo and regional left-wing parties, the official name being announced on 13 May 2016 as Unidos Podemos ("United we can"). They got 21.2%. Podemos branded as "Adelante Andalucía" together with the left and the Greens (left) and Primavera Andaluza in the 2018 2018 Andalusian regional election. Economic recovery: with emphasis on public control, poverty reduction and social dignity via a basic income for everyone, it includes lobbying controls and punitive measures against tax avoidance by large corporations and multinational organizations as well as promotion of smaller enterprises. Promoting liberty, equality and fraternity: breaking down barriers across Europe and allowing people to cooperate fairly and freely without either intelligence gathering or social stigma. Redefining sovereignty: revoking or curtailing the Treaty of Lisbon, abandoning memoranda of understanding, withdrawing from some free trade agreements and promoting referenda on any major constitutional reform. Healing the environment: deals with reduction of fossil fuel consumption, promotion of public transport and renewable energy initiatives, reduction of industrial cash crop agriculture and stimulating local food production by small and medium enterprises. The support obtained by the new formation after the European elections in 2014 resulted in multiple analyses and reactions. While some sectors welcomed the results, there were also expressions of concern. Pedro Sanchez, Secretary General of the Spanish Socialist Workers' Party (PSOE) since July 2014, branded Podemos populist on numerous occasions at the beginning of his term while much of its electorate opted for the new party. The New York Times stated that a challenge for Podemos would be putting together a true agenda noting that "the party’s 36-page campaign program reads like a wish list, with little detail about how it could be financed at a time when Spain is still struggling under a heavy debt burden". Vicente Palacio of Fundación Alternativas said that Podemos could have "very beneficial effects in terms of regenerating the Spanish democratic system", but is in danger of going "toward populism and demagogy, as has happened in the case of Beppe Grillo and his Five Star Movement in Italy". As of November 2014, the PSOE has instead chosen to distance itself from populism and the extreme left to preserve the center left. The leader of Union, Progress and Democracy (UPyD) Rosa Díez said that similarities can be found with the Greek left-wing coalition Syriza, with the Five Star Movement of Beppe Grillo and even with the French right-wing National Front of Marine Le Pen. The spokesman for the People's Party María Dolores de Cospedal said that poll results show a radicalization of the left vote. Esperanza Aguirre, another prominent member of the People's Party, accused Pablo Iglesias of "being with the Castrismo, with Chavismo and ETA", which Iglesias responded to statements described as "slander" and announced he would consider legal action. The leaders of Podemos also tried to distance themselves from the government of Venezuela following allegations of "murky" funding since many Podemos leaders were linked to Venezuela and other "revolutionary" movements in Latin America. Consulting work in leftist Latin American governments involving several members, including Iglesias, earned their consulting organization, Center for Political and Social Studies Foundation (CEPS Foundation), €3.5 million, which helped fund the television debate shows that helped Podemos' popularity to increase quickly. Podemos called for an external auditor to observe accounts from February 2014 to December 2014 which showed that the total income from both private donations and state subsidies was at about €947,000, though the largest donors to the party were Podemos' own five MEPs. Since March 2015, journalists have been critical of the relationship between the political party and the traditional media. In this sense, the Madrid Press Association (APM) issued a statement in March 2017 to give shelter to a collective of professionals who claimed it. The party's formation and campaigning were the subject of the documentary Politics, Instructions Manual. According to GlobalPost, Podemos and other parties of the left have suddenly grown because of Europe's economic difficulties. Unemployment, especially among young Spanish adults, has created a positive sentiment towards Podemos and their appeal to the unsatisfied youth of Spain with an "irreverent style". Podemos also used its very well run social media presence to its benefit to find popularity. After it received the fourth highest number of votes in the European elections, news related to the growth of Podemos started to be published. The hashtag Pablo Iglesias was the number 1 trending topic on Twitter in Spain the day after the elections and Iglesias appeared on the front page of prominent Spanish newspapers. Before the elections, Podemos was already the most popular political force within social networks, but it had increased from 100,000 to 600,000 "Likes" on Facebook between May and July 2014. The CIS' quarterly survey, polling over July 2014 (two months after the elections) showed Podemos as the second most popular party regarding direct intention of vote, surpassing the PSOE, but being a 0.9% behind the PP. In late July, Podemos started to allow individuals to sign up, with 32,000 people registering as members in the first 48 hours through Podemos' website for free. In the first 20 days, Podemos already had about 100,000 members, becoming the third largest Spanish party by membership, surpassing United Left (IU), Union, Progress and Democracy (UPyD), Convergence and Union (CiU) and Basque Nationalist Party (PNV/EAJ). In August 2014, Podemos already had 442,000 more "Likes" on Facebook than the "Likes" of the rest of the parties combined, having 708,763, with more than 2.6 million views on its YouTube channel. In September 2014, the interview of Iglesias in Viajando con Chester had almost 3 million watchers, being the most watched programme in its timeslot with 14.5% of the audience share. In October 2014, Iglesias' participation in La Sexta Noche (in which he was also interviewed) rose the audience share of the programme to 16,2%, which is its historical maximum. Iglesias' interview in Salvados also made the programme have its best ever audience, with a 23.8% and 5 million watchers. In late October, Podemos had more than 200,000 members. On 2 November 2014, El Pais published an opinion poll which gave Podemos 27.7% approval rating, compared to PSOE's 26.2% and PP's 20.7%; and gave Podemos a direct intention of vote of 22.2%, compared to PSOE's 13.1% and PP's 10.4%. The party lost much support in the polls during the final months of 2015 when elections were approaching (sinking to 13%) whereas during the election campaign experienced a huge rise in support in the polls up to 20% of vote days before the election . ^ Iván Gil: "Instituto 25 de Mayo para la Democracia: Podemos ya tiene su 'think tank' oficial". El Confidencial. 17 April 2015. ^ a b c d "Iniciar sesión – Podemos". Podemos. ^ Eduardo Z. Albrecht (2017-01-28). Alter-globalization in Southern Europe: Anatomy of a Social Movement. ISBN 9781137597588. ^ a b Nordsieck, Wolfram (2016). "Spain". Parties and Elections in Europe. Retrieved 30 August 2018. ^ Cristóval Rovira Kaltwasser (2014). Carlos de la Torre (ed.). Explaining the Emergence of Populism in Europe and the Americas. The Promise and Perils of Populism: Global Perspectives. University Press of Kentucky. p. 211. ISBN 978-0-8131-4687-4. ^ Christopher Ross; Bill Richardson; Begoña Sangrador-Vegas (2016). Contemporary Spain. Routledge. p. 75. ISBN 978-1-317-75164-9. "Spain's ruling PP wins EU vote, political fragmentation rises". Reuters. 25 May 2014. Retrieved 12 January 2015. ^ "Pablo Iglesias: How the leader of the leftist Podemos party upset Spain's elites to reach the brink of power". The Independent. 2015-12-25. Retrieved 25 December 2015. ^ Pilar Orti (2012). The A to Z of Spanish Culture. Lulu.com. p. 52. ISBN 978-1-4717-3657-5. ^ Norman Schofield; Gonzalo Caballero (2015). The Political Economy of Governance: Institutions, Political Performance and Elections. Springer International Publishing. p. 131. ISBN 978-3-319-15551-7. ^ Federico Finchelstein (2017). From Fascism to Populism in History. Univ of California Press. p. 135. ISBN 978-0-520-29519-3. ^ Michelle Cini; Nieves Perez-Solorzano Borragan (2016). European Union Politics. Oxford University Press. p. 414. ISBN 978-0-19-870893-3. ^ Natalie Fenton (2016). "Politics in common in the digital age". In Ash Amin; Philip Howell (eds.). Releasing the Commons: Rethinking the futures of the commons. Taylor & Francis. p. 72. ISBN 978-1-317-37536-4. ^ John Abromeit; Bridget Maria Chesterton; Gary Marotta; York Norman (2015). "Introduction". In John Abromeit; York Norman; Gary Marotta; Bridget Maria Chesterton (eds.). Transformations of Populism in Europe and the Americas: History and Recent Tendencies. Bloomsbury Publishing. p. 19. ISBN 978-1-4742-2522-9. ^ Cas Mudde (2016). On Extremism and Democracy in Europe. Taylor & Francis. p. 141. ISBN 978-1-317-22221-7. ^ José Luis Villacañas (15 June 2014). "¿Cuadrar el círculo? El éxito de Podemos". El Confidencial. ^ Norbert Bolbeny (5 June 2014). "L'auge del populisme". RAC 1. ^ Carlos Fernández Liria (30 June 2014). "Podemos qué, algunas reflexiones sobre un supuesto populismo". P36Andalucía. ^ García, Gustavo (28 October 2014). "Podemos ya tiene más 'militantes' que el PSOE". elboletin.com. ^ a b c "Podemos ya es la tercera fuerza en afiliados con 100.000 registrados". Público. 17 August 2014. ^ Manuel Castells (4 June 2015). Networks of Outrage and Hope: Social Movements in the Internet Age. Wiley. p. 299. ISBN 978-0-7456-9577-8. ^ Kassam, Ashifa (21 December 2015). "Spanish election: national newcomers end era of two-party dominance". The Guardian. Retrieved 21 December 2015. ^ a b "Spanish leftists Podemos boosted by new electoral alliance". ^ Muller, Jan-Werner (2016). What Is Populism?. University of Pennsylvania Press. pp. 8–9. ISBN 9780812293784. Both—especially Podemos—make a point of feeling inspired by what is commonly referred to as the “pink tide” in Latin America: the success of populist leaders such as Rafael Correa, Evo Morales, and, above all, Hugo Chávez. ^ cuatro.es, ed. (14 January 2014). "Pablo Iglesias anuncia su intención de presentarse a la elecciones europeas". Retrieved 24 May 2014. ^ Kassam, Ashifa (25 August 2015). "Podemos leader backs Jeremy Corbyn campaign for Labour leadership". The Guardian. Retrieved 15 July 2017. ^ "Podemos – GUE/NGL – Another Europe is possible". ^ a b Gómez, Luis (26 May 2014). "The untamed ambition of Podemos, the surprise victor in Sunday's poll". El País in English. Retrieved 31 May 2014. ^ Kassam, Ashifa (27 May 2014). "Podemos hopes to cement rise of citizen politics in Spain after election success". The Guardian. Retrieved 31 May 2014. ^ Precedo, José (5 June 2014). "Podemos elige este mes un equipo para pilotar la asamblea fundacional de otoño". El País. Retrieved 12 June 2014. ^ Europa Press (11 June 2014). "Podemos elige al equipo que organizará su asamblea de otoño entre al menos dos listas cerradas". Retrieved 12 June 2014. ^ "El círculo de enfermeras de Podemos presenta una lista alternativa". El País. 12 June 2014. Retrieved 16 June 2014. ^ Precedo, José (9 June 2014). "Las bases de Podemos se enfrentan a sus fundadores para exigir democracia interna". El País. Retrieved 12 June 2014. ^ Precedo, José (14 June 2014). "Pablo Iglesias obtiene el 86% de los votos para liderar Podemos". El País. Retrieved 16 June 2014. ^ Pais Beiro, Mario (15 September 2014). "Podemos da el pistoletazo de salida a su maratón de decisiones". eldiario.es. ^ García, Fernando (19 October 2014). ""No hemos venido para echarnos a un lado", replica una eurodiputada a Pablo Iglesias". La Vanguardia. ^ "Malestar entre las bases críticas de Podemos por los "cambios en las reglas del juego"". El Confidencial. 22 October 2014. ^ "Objetivos de Podemos: reestructuración de la deuda y paralización de los desahucios". Público. 19 October 2014. ^ Riveiro, Aitor (27 October 2014). "Podemos confía en Pablo Iglesias: su modelo obtiene el 80,7% de los votos". Eldiario.es. ^ Manetto, Francesco (27 October 2014). "Podemos confía todo el poder a la estrategia política de Pablo Iglesias". El País. ^ Del Vecchio, Paola. "Podemos party revolutionizes Spanish politics". ansamed.info. Retrieved 25 December 2014. ^ "Spain faces new elections in June after parties fail to form a government". ^ "Spain's King Felipe calls new election amid political deadlock". ^ "Pedro Sánchez: "El populismo ha encontrado su expresión institucional en Podemos"". Publico. Retrieved 16 December 2014. ^ "¿De dónde vienen los votos de Podemos?". Europa Press. 2014-11-05. Retrieved 16 December 2014. ^ a b Minder, Raphael (29 May 2014). "Spanish Upstart Party Said It Could, and Did. Now the Hard Part Begins". The New York Times. Retrieved 16 December 2014. ^ Diez, Anabel (30 November 2014). "El PSOE tratará de situar a Podemos en la extrema izquierda". El Pais. Retrieved 16 December 2014. ^ Manetto, Francesco (1 December 2014). "El PSOE y Podemos se disputan la hegemonía de la izquierda". El Pais. Retrieved 16 December 2014. ^ "Rosa Díez cree que las propuestas de Podemos se parecen a las de Syriza, Beppe Grillo e incluso Le Pen". Europa News. 27 May 2014. Retrieved 16 December 2014. ^ "Elecciones europeasCospedal ve "prematuro y alejado de la realidad" enterrar el bipartidismo". ABC.es. 26 May 2014. Retrieved 16 December 2014. ^ Manetto, Francesco (4 July 2014). "Pablo Iglesias ve "infamia" en las palabras de Aguirre y contempla acciones legales". El Pais. Retrieved 16 December 2014. ^ a b c Badcock, James (2 March 2015). "Podemos struggles to rebuff Venezuela link". The Daily Telegraph. Retrieved 15 March 2015. ^ a b Chicote, Javier (24 February 2015). "Las actas de la fundación chavista CEPS acreditan los lazos con los líderes de Podemos". ABC. Retrieved 15 March 2015. ^ "Reviews of March 2015". EP. ^ "Spanish party Podemos accused of intimidating journalists". El País. ^ a b c Ames, Paul (15 November 2014). "Europe looks left". Global Post. Retrieved 8 January 2015. ^ Trendinalia. "Trending topics en Twitter en España el 26 de mayo de 2014". ^ a b Bollero, David (August 16, 2014). "Podemos se consolida como la primera fuerza política en redes sociales". Público. ^ Hernández, Marisol (August 4, 2014). "Podemos supera al PSOE en intención de voto directa". El Mundo. ^ Álvaro Carvajal (July 31, 2014). "Podemos suma 32.000 'afiliados' en 48 horas". El Mundo. ^ "Podemos suma casi 100.000 inscritos en 20 días". Huffington Post. August 17, 2014. ^ Redacción (September 29, 2014). "Pablo Iglesias gana la batalla de la audiencia a Artur Mas". La Vanguardia. ^ Terán, Borja (October 5, 2014). "Pablo Iglesias lanza a 'La Sexta Noche' a máximo histórico de audiencias". lainformacion.com. ^ Migelez, Xabier (27 October 2014). "'Salvados', con Pablo Iglesias, bate su récord histórico con un 23,8% y más de 4,9 millones". Fórmula TV. ^ a b López de Miguel, Alejandro (27 October 2014). "La propuesta de Iglesias para constituir Podemos gana por amplia mayoría con un 80,71%". Público. ^ Garea, Fernando. "Podemos supera a PSOE y PP y rompe el tablero electoral". El País. Fernández-Albertos, José (2015) Los Votantes de Podemos: Del partido de los indignados al partido de los excluidos. Madrid: Libros de la Catarata. Rodríguez Teruel, Juan; Barrio, Astrid; Barberà, Oscar (2016) "Fast and Furious: Podemos' quest for power in multi-level Spain". South European Politics and Society. Taylor and Francis. doi: 10.1080/13608746.2016.1250397. Published online. Wikimedia Commons has media related to Podemos.